SEATTLE, Washington ï¿½ Two innocent and patriotic citizensï¿½ dodge 64 IRS lethal bullets in a triumph for justice and the American way. Last Christmas, the spirit of the season bestowed upon a Montrose, CO couple the greatest gift of all, freedom! James and Pamela Moran, facing a possible 180 combined years of incarceration were found not guilty by a jury of their peers on all 64 charges of an indictment in a Federal Courtroom. This victory defied all odds because the Morans were convicted of the same charges in December of 2004. The Ninth Circuit Court of Appeals overturned the Moranï¿½s 2004 convictions, granting them the new trial. Staying true to form the government once again indicted the Morans and a court date was set for early December of 2007. The government expected the same outcome from this trial as they experienced in the first one in 2004. Now enters a ringer for the Morans in Texas attorney, and former Golden Gloves Champion, Michael Minns. So it was back to Sleepless in Seattle for round two. This time the Assistant United States Attorneys (AUSAï¿½s) would draw the darling of both the right wing and left wing, with G. Gordon Liddy on the right endorsing Minns as America's top criminal tax defense lawyer on his top rated national radio show. Liddy also plugged Minnsï¿½ book, "How to Survive the IRS" in 2001. On the left wing, Geraldo Rivera based two shows in 1991 and 1992 on innocent clients freed by Minns' remarkable legal skills, while endorsing Minns' best seller, "The Underground Lawyer.ï¿½ Minnsï¿½ thirty year career has been noted for his envelope pushing defenses of citizens against what he calls, "The American Gestapo", and "The Tax Terrorists" - The IRS! Mickey Brown, the former Texas middle weight champion, who trained Minns and worked his corner when he won the 1969 Golden Gloves Boxing Championship Title remarked that, ï¿½In boxing you wear a cup to protect you from the low blows. I taught Mike to avoid low blows and he has made a career out of stopping lawyers and the IRS from landing them. Pound for pound he's the best Tax Defense lawyer and the Best Legal Malpractice lawyer in the country. And you need both to fight these unscrupulous terrorists." Itï¿½s true that Minnsï¿½ unblemished string of acquittals for clients and reversals on appeal won him widespread acclaim, but his combination of skills in which he maintained a practice suing bad lawyers and accountants led to his most unusual conquest; that of winning the largest Test Case Petitioner reversal and tax refund case in United States history. This accomplishment entailed obtaining a circuit court finding that the IRS had indeed committed a fraud in court against 1300 airline pilots during a 2003 tax case. Without missing a jab or combination flurry Minns dismantled the careers of two corrupt IRS lawyers who promoted the fraud for fun, profit and self aggrandizement. Mr. Kenneth W. McWade and his superior William A. Sims were subsequently suspended from their respective state bars and lost their privilege to practice law before the Tax Court due to Minnsï¿½ efforts. This was the first time in history that IRS lawyers were publicly and thoroughly punished for their fraud, all the while on the taxpayersï¿½ payroll. Treat the IRS code with that much irreverence and you end up in a jail cell. The Morans, sitting at the same table, in the same court room where they had been convicted and sentenced to serve hard time in prison, nearly three years earlier, were of course concerned. They had nothing more than their innocence, their faith, and Michael Minns' team to support them. While each of the counts had been won (often by Minns in previous trials) by themselves, no one had won a dozen straight counts, on off shore tax counts, coupled with money laundering accounts, and wire fraud counts, since a New York lawyer in the 60's, straight across the board. While some lawyers brag about winning a few of the counts (forgetting to talk about losing a few counts too), in today's sentence-guidelines-directed Federal system, each count is like a bullet...one guilty count means time in prison. Minns counts each bullet as a defeat. The government had indicted the Morans with 64 counts, 64 bullets, and the first time they had fired their machine gun all 64 bullets had stolen blood from the Morans. While the appellate court removed all 64 bullets, the emotional scars were still there on this Minister and his Sunday school teacher, Church organist wife, who had, three years earlier, listened as the Judge read the verdicts of guilty one after the other, and then ordered them to prison if they lost their appeal. So they faced the same table prepared before them in the presence of their enemies, but also in the presence of an American Jury sworn to presume innocence. On February 28, 2001, the IRS conducted the largest raid in its history covering three countries, Canada, Costa Rica and the United States, leading to the indictments of dozens of people across the country that worked for or purchased products from an organization called Anderson Ark and Associates (AAA) based in Costa Rica. During the next six years, indictments rained down from Washington targeting nearly everyone who participated in the organization, either as a developer, unsuspecting promoter, or trusting client. From February 2001 until November 2007, the IRS had a 100% conviction rate. That on the surface may be an impressive record but when the truth is finally revealed their success is not unlike a ballplayerï¿½s stats while on steroids. If someone was one of the 25,000 participants the odds were very high that that person would be indicted, prosecuted, tried and convicted. What was their offense? ï¿½ Actually, it was following the Internal Revenue Tax Code. The Morans became involved in AAA through a professional relationship with Roosevelt Drummer, a former IRS agent who rendered them tax accounting assistance years earlier. Mr. Moran, a Viet Nam veteran and minister, who, along with Pamela a church organist truly believed in the AAA mission of ridding people of debt and creating wealth. Their passion for this program led them to a leadership position within the organization, assisting others in marketing various products and opportunities. For their efforts in helping others they were subjected to humiliation through investigations, indictments, arrest and two Federal trials that drew national exposure in Seattle, WA. Included in this Federal travesty was confiscation of their worldly possessions, including their home and new Jeep. The charges included alleged charges of wire fraud, money laundering and assisting in the preparation of false tax returns. This form of incrimination is particularly odd since the Moranï¿½s were not privy to the clientsï¿½ tax returns, nor did they suspect that they were doing anything unlawful or illegal. The money they were accused of defrauding people out of included their own money which they never got back. The Morans were literally accused of being involved in a conspiracy to steal money from themselves. Never the less they were put on trial in late 2004 along with four Certified Public Accountants or IRS enrolled agents, the alleged ring leaders of the organization, Keith Anderson of Costa Rica and Wayne Anderson from Central California, as well as the head of United States operations Richard Marks. The first trial lasted for more than a month ending with guilty verdicts for the Andersons, Marks and James and Pamela. The CPAï¿½s verdicts were hung and the government agentsï¿½ threats to pursue them with another trial eventually led to their capitulation, because of the stress and financial ruin to which they were being subjected. The mighty Department of Justice got their marks and all was well with the world. Not quite, ruled the Ninth Circuit Court of Appeals. Much to the chagrin of the Assistant United States Attorneys, it appears the over zealous prosecutors and judge in the 2004 trial failed to allow Pamelaï¿½s testimony regarding her state of mind as to her intent to break the law to be heard during the trial. As has happened in other AAA trials the government, and in some cases the defense attorneys, took all precautions to keep the defendants from telling their story. It appears this inconvenient truth threatened their desired outcome, for if the juries were allowed to hear defendants argue that there was no willfulness or knowledge of breaking any law they would be found not guilty. The Morans being good law abiding folk only wanted to help others less fortunate than themselves or help those more fortunate to find tax deferment advice from the CPA staff. Tax avoidance is not the same as tax evasion and is an acceptable practice sought out by people every day all over this country. Unlike those victims/defendants that were tried before them, the Morans, with the assistance of Michael Minns, his daughter Attorney Rain Minns, Peter Mair and John Zulauf, heard angels singing when all counts of the indictment received a not guilty verdict. The IRS skein of convictions stopped when the Jury of 12 citizens heard the truth and exposed the callous disregard the tax enforcers have for honest people looking for investment advantages. More importantly the acquittals proved that everyone in the organization below the Moranï¿½s level, including those that promoted the program never had any knowledge that the program was anywhere near illegal, a point that the IRS or the DOJ has not bothered to prove. In fact, the prosecutions occurred because the people involved did not hold elite status as determined by government bureaucrats. Hundreds of lives have been damaged and some destroyed because of run amuck government agents and deceitful prosecutors and in most cases compliant judges. For the Morans these verdicts ended nearly seven years of horror as they lived with the fear of being separated if imprisoned, loss of their assets, reputations and alienation of friends and neighbors. Enrolled Agent Collis Redd, reviewing the cases remarked, "If you can't hire Minns or get a lawyer willing to study his books and techniques, pack your tooth brush. You are going to jail. No one else knows how to defend the innocent taxpayer in court. Minns wrote the book, actually, both of them." Congressman and Presidential contender Ron Paul said, "Working in the tradition of the framers is attorney Michael Louis Minns. He has defended many Americans against the depredations of the tax police, and argued for a fair and constitutional system in place of the personal income tax." Congressman Ron Paul also wrote the introduction to Minnsï¿½ second book. John Berthound, President of the National Taxpayers Union said, "Tax-and-Spend Members of Congress and their shrill media allies proclaim that 'tax cheating' is rampant and on the rise because of recent IRS reforms. Michael Minns provides prima facie evidence against those who would like to make us think we've gone 'too far' in trying to rein in IRS abuse and change the way we tax our citizens." So it is said that behind every successful man there stands a strong capable woman and in this case she is Minns' daughter Rain, who volunteered to act as co-counsel with her Father. With a successful career helping bring justice to people harmed in senior housing facilities behind her, she answered the call to pitch in and got the defense team ready for trial. This was a daunting task as the Minns team had all of three months to un-track the U.S. Government team of prosecutors. Rain Minns, a long time advocate for tax justice will continue as a partner in her fatherï¿½s firm to help people like the Morans and other investors in AAA, or victims of malicious prosecution everywhere who didn't get their fair day in court. What follows are vignettes portraying some of the tactics used by the men in black. During the recent trial one witness spoke about the government asking her to lie about the Morans and make them out to be at the top of the AAA organization. What is astounding is that she was asked this question by the prosecutor after Minns question was objected to and sustained. Probably the person in charge of the attack on the Morans, that did the most damage to these two innocent people, was CID agent Michelle Hagemann, known for her shoot-from-the-hip and asks-questions-later style of investigation. CPA Joseph Moschetti of Grand Junction, CO took it upon himself to personally destroy the Morans. Moschetti, who may have been concerned about losing a client to AAA took it upon himself to act as an investigating agent and recorded phone calls with the intent to entrap the Morans. These tapes were handed over to CID agent Hagemann, who under oath admitted she had a professional relationship with Moschetti, who swore to bring the Morans down. Hagemann also admitted, ï¿½The tax code can be complex depending upon which section you are looking at.ï¿½ Minns stated he had trouble understanding the relationship between Hageman and Moschetti, who Hageman called the most honorable and honest of individuals. On the stand Hageman avoided answering this question ten ways from Sunday, until finally, under Minns' polite but persistent questioning, she admitted that there was more to her relationship with Moschetti than simply an IRS agent to an informant. Minns kept asking: "How is it that this CPA has the phone number of an IRS Special Agent? Isn't that unusual?" And the truth finally came out. Not only did Hageman accompany Moschetti personally to an Anderson Ark meeting where the Moran's were speaking, she finally admitted, he also prepared her personal tax returns. "Will Moshetti get a reward for turning these people in?" Minns asked her. And again she avoided the straight answer saying: "I know nothing about it," until finally she admitted it was possible that a request would possibly come to her when all the trials were over. To this day the IRS has never proven the AAA program illegal. In fact, this paper reported over 18 months ago that the IRS auditors did not consider the program illegal, but the Department of Justice attorneys were prosecuting participants as if it were the largest tax scam in history. Presumption trumps reality every time. Now letï¿½s get the Moransï¿½ Jeep back. 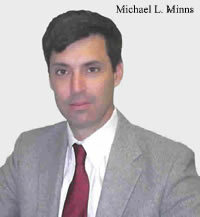 Attorney Michael Louis Minns resides near Katy, Texas a suburb of Houston. 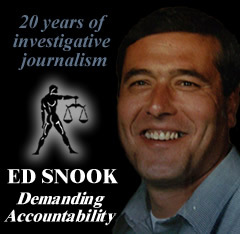 Edward Snook is 20-plus year investigative journalist, with a college major in criminal justice and the publisher of US-Obsrver newspaper. The Morans, sitting at the same table, in the same court room where they had been convicted and sentenced to serve hard time in prison, nearly three years earlier, were of course concerned. They had nothing more than their innocence, their faith, and Michael Minns' team to support them.